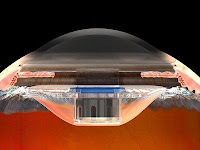 In a decision cheered by advocates for the visually impaired, federal regulators Tuesday approved a Saratoga company's first-of-a-kind implantable eye telescope for elderly people with an advanced form of age-related macular degeneration. The device made by VisionCare Ophthalmic Technologies is aimed at about 750,000 people in the United States who have the most severe and untreatable form of the disease, which causes a blind spot in the center of their vision. "This innovation has the potential to provide many people with an improved quality of life," said Dr. Jeffrey Shuren, director of the Center for Devices and Radiological Health at the U.S. Food and Drug Administration, which approved VisionCare's device. Getting the FDA's approval is a big moment for privately held VisionCare, which has been developing the telescope for more than a decade. In 2006, an FDA advisory panel recommended the telescope not be approved because of concerns about its usefulness and safety. But after VisionCare did more studies, the panel unanimously gave the device its blessing. vice president for business and market development. Even though most of the approximately 8 million people suffering from the disease in this country won't qualify to be treated with the device, advocates for patients suffering from the ailment hailed the FDA's approval. "It's very exciting," said Dan Roberts, founding director of Macular Degeneration Support, a group he founded after he was diagnosed with the illness. "The product needs to be given a chance — anything that is going to give the patients better sight until we have a cure, anything that's going to give hope." Dziem Nguyen, a supervisor at the Santa Clara Valley Blind Center, also was enthusiastic. Noting that most of the center's patients suffer from age-related macular degeneration, she called the FDA's action "really good news to our folks here." The ailment, which primarily afflicts the elderly, damages the center of the retina — or macula — which is the light-sensitive tissue at the back of the eye. The result is deteriorated sight in the center of the visual field, causing blurriness and eventually an inability to recognize faces, read or watch television. The FDA limited VisionCare's telescope to people 75 or older, whose disease has progressed to a severe state. The device — which is about the size of a pea — is implanted in an outpatient procedure behind the colored portion of the eye known as the iris after the patient's own lens is removed. By magnifying vision by 2.2 times to 2.7 times, depending on which model is used, the device projects visual images away from the damaged macula and onto the surrounding healthy retinal tissue. It is placed in only one eye, since the patient's other eye is needed for peripheral vision. 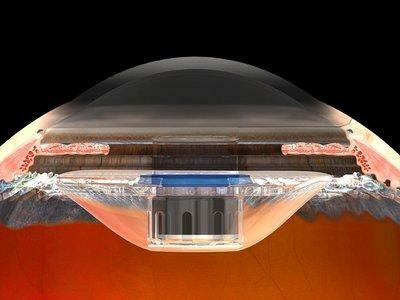 In a study involving more than 200 patients implanted with the device, the FDA said, 75 percent "improved their level of vision from severe or profound impairment to moderate impairment." Although the device is approved for people with advanced wet or dry age-related macular degeneration, patients need to consult with a specialist and be tested to determine whether they are good candidates for the surgery. In some cases, the implantation can distort the cornea's clarity, the FDA said. As a result, the federal agency is requiring VisionCare to conduct follow-up studies on patents outfitted with the telescope. Kumar said the company has not set a price for the device because that will depend on how much Medicare will agree to cover. When those details are worked out over the next couple of months, patients can start getting implanted with the telescope, he said, noting that details about when the device will be available will be posted on www.centrasight.com.